John Grogan, Company Secretary of the Irish Farmers Journal launched Emerald Expo 2013 on January 29th at the RDS, Dublin 4. Guests were welcomed by Richard Whelan the Show Co-ordinator. Presentations were also made by Charles Gallagher, Chief Executive of the Irish Holstein Friesian Association (IHFA) and Kevin Tuck, Managing Director of Alltech Ireland. 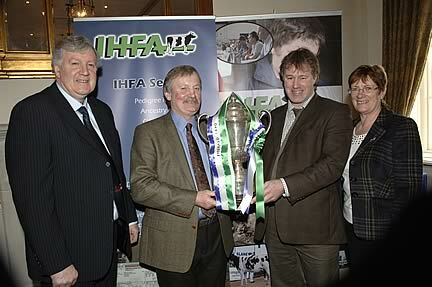 Pictured at the launch of the Emerald Expo 2013 dairy event in the RDS, Dublin are l/r Dessie Dunlevy, ABS Ireland, Richard Whelan, Show Coordinator for Emerald Expo and Chairman of the IHFA with Michael Lynch, Manager, Kilkenny Mart, Cillin Hill and IHFA President, Kathleen Kelly. 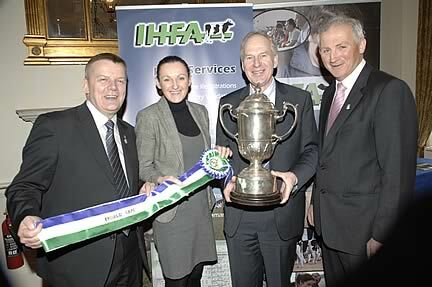 Emerald Expo 2013 is organised by the IHFA in association with Alltech Ireland the major sponsor. It will have 20 classes, six Championships and a prize fund of €25K, one of the biggest for any EU livestock event. The show has the support of all the dairy breeds- Pure Friesian, Jersey and Shorthorn. The YMA members will again bring an international flavour to the young stockmanship classes. For the third consecutive year, Emerald Expo an All Ireland and All Dairy Breeds show will take place at Cillin Hill, Kilkenny an easily accessible and prime location. 90% of all dairy cattle in the Republic are located within 100 miles of this venue so it is an excellent site for the first dairy show of the season. The date has been moved to Saturday, April 27th so as to better facilitate dairy farmers, sponsors and trade exhibitors. April is an ideal month as most cows have calved, are out on grass and silage harvesting is not in progress. Milk producers will now have more time to attend, network with other dairy farmers and enjoy a well deserved weekend break in the Marble City. Kevin Tuck, Managing Director of Alltech Ireland said that “Alltech are once again delighted to be main sponsor of Emerald Expo which is now established as one of the leading events in the Irish Dairy calendar”. Pictured at the launch of the Emerald Expo 2013 dairy event in the RDS, Dublin are l/r Kevin Tuck, Alltech Ltd, Dunboyne, Co. Meath, Aileen Barron, KW Forage Systems with Charles Gallagher, Chief Executive of the IHFA and Henry Corbally, Vice Chairman of Glanbia Plc. The launch in the RDS was well attended by the Ag media, representatives from dairy breed societies, farm organisations, major sponsors, Teagasc, trade etc. Emerald Expo 2013 is organised by the IHFA in association with Alltech Ltd. Significant supporters every year include the Dept. of Agriculture and Food, Glanbia and other Agribusiness sponsors such as AIB Bank, Dairymaster, KW Forage Systems, Lakeland Dairies, Pfizer Animal Health and Volac. Other sponsors include Alta/Bova, Animax, Dovea Genetics, Eurogene/LIC and Progressive Genetics/Semex.